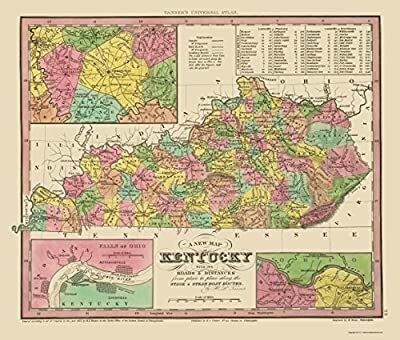 Old State Map - Kentucky, Tennessee Counties - Tanner 1833 - This is an exquisite full-color Reproduction printed on high-quality gloss paper, art paper or canvas. Sites and Townships Specific To This Map Are: Cincinnati, Louisville, Frankfort, Barbourville, Greensburg, Elizabethtown, Litchfield, Bartford, Hopkinsville, Madisonville, Princeton, Russelville, and others. The following towns are featured: insets of the Falls of Ohio, The Ohio River from Clarksburg to Maysville, and the counties surrounding Lexington. Two tables show distances from Louisville to Pittsburg, and also New Orleans. Distances to towns along the way, are also shown. This Map is Situated in: State of Kentucky (KY), USA. Original Maps are often difficult to find and usually have fold lines, identifying stamps or markings, tears, ragged edges, and assorted other natural signs of age that detract from their beauty. All of our maps have been professionally restored to depict their original beauty, while keeping all historical data intact. These maps are fabulous pieces of history full of information useful to Historians, Genealogists, Cartographers, Relic Hunters, & Others. They make fascinating conversation pieces and splendid works of art for the home or office.